Have you seen wanted Matthew Turner? Local police are appealing for the public’s help in tracing a “wanted man”. 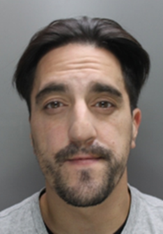 According to Welwyn Hatfield South police, Matthew Turner, aged 38 from Welham Green, is “wanted on recall to prison”. Police say Turner has links to Hatfield, Hertford and Bishop’s Stortford. Anyone who has seen him or has information about his whereabouts should contact Hertfordshire Constabulary via the non-emergency number 101 or online, quoting crime reference 41/1190/19.